Visitors can sign up with the affiliate program when registration is enabled for the site. This needs to be enabled to let interested partners join through the affiliate registration form. When visitors are interested in joining the affiliate program, they can submit their application via the registration form and receive an email message indicating the username and password that allows them to log in. Notifications are sent to the site administrator email account and the new affiliate’s email address. The notifications are enabled by default and can be configured and customized as shown under Notifications. 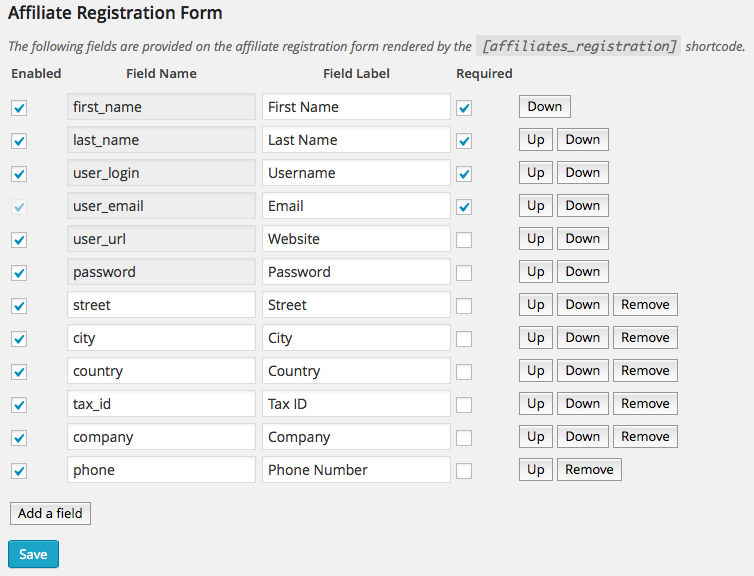 The site administrator can also choose the status of new affiliates registering. This status can be either Active or Pending. The status of registered affiliates can be altered under Affiliates > Manage Affiliates by editing the desired record. If your affiliate manager should be able to approve new affiliates before they can access their Affiliates Dashboard and work with your site, you should set this to Pending. Manual approval of new affiliates is then required. This setting allows to choose a page that should hold the terms and conditions of the site’s affiliate marketing program. If a page is selected here, a disclaimer and link to the page will be displayed with the registration form. first_name : The affiliate’s first name. last_name : The affiliate’s surname. user_login : The user login. The user’s email address will be used if this field is disabled. user_email : This is required registration information and thus the main field. user_url : For the affiliate’s website. password : The affiliate can choose her/his own access password. If this field is not enabled, a password will be generated automatically. 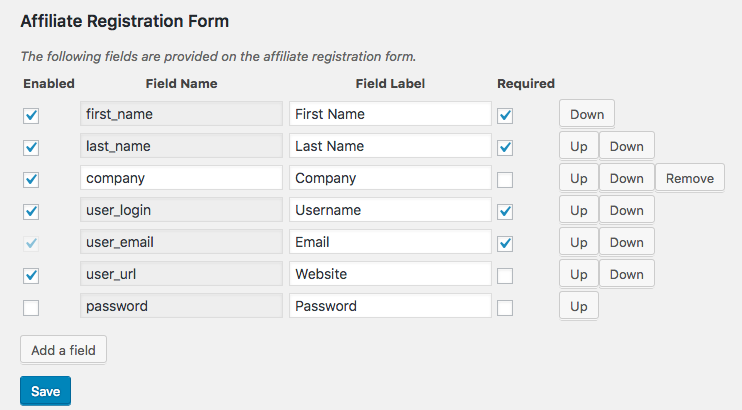 Field labels are shown on the registration form, affiliate profile and user profile. Any number of additional fields can be added to complete the particular information that you want new partners to provide. A field with special significance is payment_email. If you add a field whose Field Name is payment_email, affiliates can indicate an alternative email address where they would like to receive payments. This field will be used automatically by the Mass Payment File generator in the Totals section. If you would like your affiliates to provide an alternative email address for payments or if you plan to use PayPal or a similar payment processor who facilitates mass payments through the use of mass payment files, you can already include this field.